There’s a lot of beauty advice out there; not all of it is good. 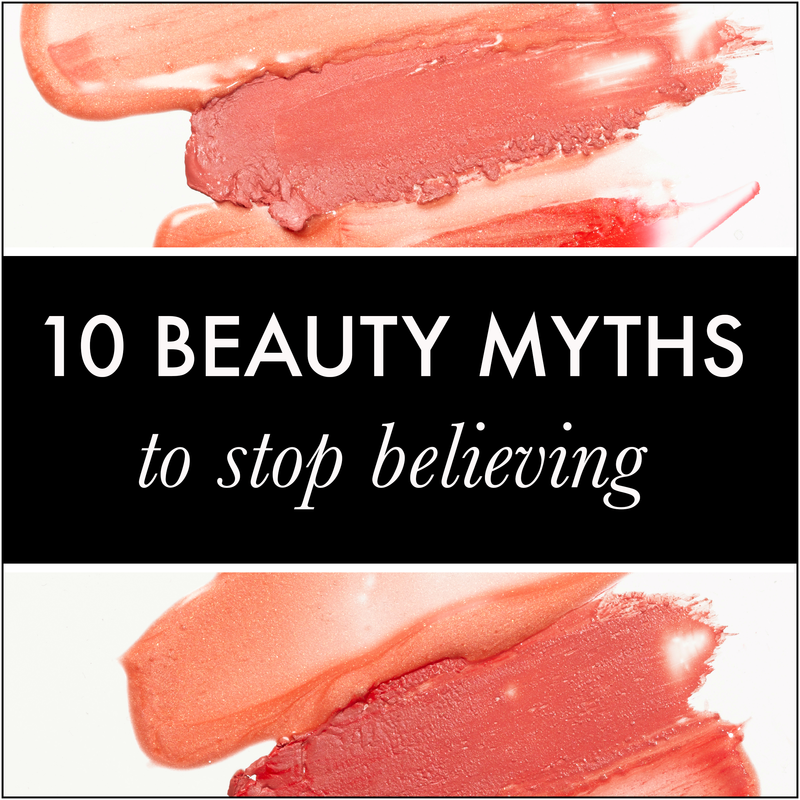 In fact, some of it is outright BS—but that doesn’t stop these totally false beauty myths from getting lodged in our minds like thorns. Here are 10 beauty myths that you need to stop believing right now. The theory behind this BS beauty advice is that, since the ring finger is the weakest finger on your hand, you apply less pressure with it, which leads to a more gentle eye cream application. This is untrue from start to finish. For one thing, studies have conclusively shown that it’s the little finger that is the weakest digit. For another, it doesn’t matter how weak the finger is when it comes to the under-eye area—it’s how you use it. You should always gently pat eye cream in to apply, never rub—and whichever finger you’re most comfortable using will do that job absolutely perfectly. Untrue. Hair follicles are individual entities; what you do to one doesn’t affect the others. But even though plucking grey hair may not expedite your progress on the road to becoming a silver fox, it also won’t do much good—because greying happens at the follicular level, the hair that grows back will be exactly as white as its predecessor. If that was true, we’d all have shaved our eyebrows off in 2012 in an attempt to elevate our brows to Lily Collins status. But alas, it isn’t the case. Shaving doesn’t affect the follicle or control the way the hair grows—all it does it cut the hair off near the skin. Because hair is thicker at the base and tapers to a fine end, this can make it look like hair has grown back thicker or more wiry…but it’s an illusion. No. Unless you’re doing full-on Kardashian Kontouring under your eyes—a look which, although lovely in photos, is REALLY intense for every day life—your concealer should always match your skin exactly. Toothpaste, especially whitening toothpaste, contains ingredients that seriously dry out your skin—we’re talking hydrogen peroxide, menthol and alcohol galore. While this may sound like a great spot treatment, this combination irritates already annoyed skin like no other, causing redness, peeling and even more zits. Keep it on your teeth and turn to more traditional zit zapping remedies for a flawless complexion. According to the Skin Cancer Foundation, one in five Americans will develop skin cancer in their lifetime, and one person dies of melanoma every minute. Sunscreen, on the other hand, is sometimes annoying to apply, and reputable studies—not crackpots on the internet—have not shown any SPF ingredients to be hazardous. The choice could not be more clear. NO, NEVER. Your cuticles form a barrier between your nail beds and the outside world. Open those up with clippers, and suddenly all kind of gross bacteria and fungus has immediate access to your body—and anyone who’s suffered through a nail infection will tell you, those bugs do NOT mess around. Plus, once you clip, you often have to keep clipping—cutting this live skin tends to damage the way it grows back, so the cuticles tend to grow back ragged and not cute. This is ridiculous, and you should roll your eyes at whoever says this to you. Once again: this is absolutely nonsensical, not to mention sexist. Helen Mirren has been rocking super glossy lips for years at this point, and we dare anyone to tell us that she looks anything less than incredible. No matter what model or actress tells you that she does this all the time, it is never okay to sleep in your makeup. Not only does it encourage bacterial growth deep in your pores (which can cause serious acne as well as skin dryness), it can also lead to major eye infections. No thank you.